With less than four weeks until the midterm elections, Republican and Democratic voters differ widely in views of the seriousness of numerous problems facing the United States, including the fairness of the criminal justice system, climate change, economic inequality and illegal immigration. 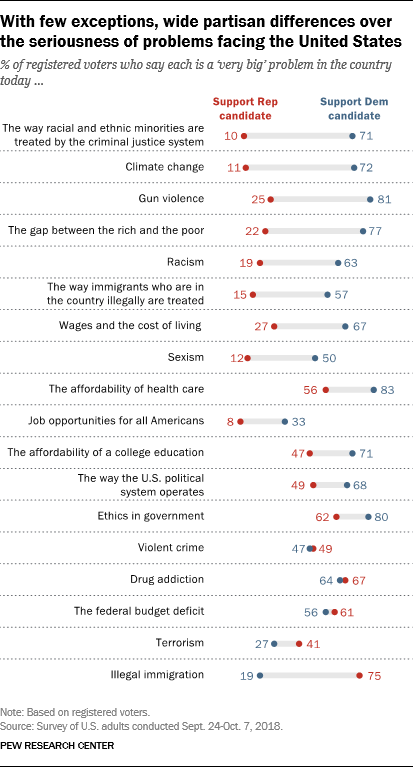 However, there are several issues that majorities of Republican voters say either are small problems or not problems at all. These include the treatment of people in the U.S. illegally (64% say it is small problem or not a problem at all); job opportunities for all Americans (61%); how minorities are treated by the criminal justice system (61%); and sexism (56%). Among voters who support the Democrat in their congressional district, 89% say sexism is a very big or moderately big problem, compared with 43% of GOP voters. And Democratic voters are about four times as likely as Republicans to say sexism is a very big problem for the country (50% vs. 12%). The survey was conducted amid the controversy over Brett Kavanaugh’s nomination to the Supreme Court and the Senate testimony on Sept. 27 of Kavanaugh and Christine Blasey Ford. Majorities in both parties say partisan control of Congress ‘really matters.’ Three-quarters of voters who favor the Democratic candidate (75%) and Republican candidate (74%) say it “really matters” which party controls Congress after this fall’s elections. Young voters and the 2018 midterms. Only about half of registered voters younger than 30 (48%) say partisan control of Congress really matters, the lowest percentage for any age group and nearly 40 points lower than the share of voters 65 and older (83%) saying this. Young voters also are less likely than older voters to say they know a great deal or fair amount about the candidates running in their districts and to express satisfaction with the quality of candidates. 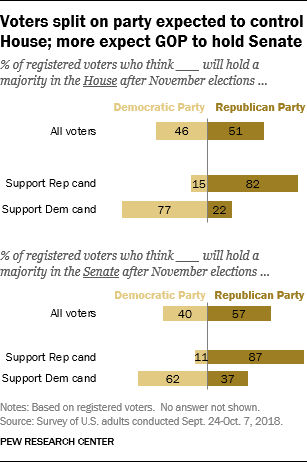 Partisans optimistic about their midterm prospects. Overall, registered voters are divided on which party will control the House after next month’s elections: 50% say the Republicans will control the House, while 47% say the Democrats. Large majorities in both parties (82% of voters who favor the GOP candidate and 77% of those who support the Democrat) say they expect their party to hold a House majority. Republicans are more bullish than Democrats about Senate control: 87% of Republican voters expect the GOP to hold a Senate majority; 62% of Democratic voters expect their party to have the majority. More say they’d be disappointed than angry over a midterm defeat. A sizable majority of voters who support the Republican candidate in their district (74%) say they would be disappointed if Democrats win a majority in the House; far fewer (20%) say they would be angry. Among Democrats, 69% say they would be disappointed if the GOP wins a majority in the House, while 28% say they’d be angry. Less than a month away from the midterm elections, most registered voters say it really matters which party wins control of Congress this fall. On a four-point scale from “it really matters which party wins control of Congress” to “it doesn’t really matter which party wins control of Congress,” 66% of registered voters select the highest-importance option (and just 7% select the lowest importance option). The share placing the highest level of importance on the midterm outcome is about the same as it was in August (68%). Registered voters who support the Democratic candidate in their district (75%) and those who support Republican candidates (74%) are about equally likely to say it really matters which party controls Congress. There continue to be wide demographic differences on how much partisan control of Congress matters. Just 48% of voters younger than 30 say it “really matters” which party wins control of Congress. The share placing high importance of partisan control increases with age, reaching 83% among voters 65 and older. About three-quarters of postgraduates (76%) and 71% of college graduates say it really matters which party wins control of Congress this fall. This view is shared by somewhat smaller majorities of those with some college experience and those with no college experience (63% each). The overall education gap in views of the stakes of the 2018 midterms is driven largely by divides among those who support Democratic candidates for Congress in their district. Overall, 85% of Democratic voters with a postgraduate degree say it really matters which party wins control of Congress this fall, compared with 67% of Democratic voters with no college experience. There are no significant education divides among voters who support Republican candidates for Congress in their district. Younger voters are less likely than older voters to say the 2018 outcome really matters within both party coalitions. But Democratic voters ages 18 to 34 (65%) are more likely than their young Republican counterparts (51%) to select the highest importance option on the four-point scale. About six-in-ten registered voters (59%) say they know either a great deal (14%) or a fair amount (45%) about the candidates running for Congress in their district. However, four-in-ten say they know not too much (31%) or nothing at all (9%) about the candidates in their district. As with views on the importance of the midterm outcome, there are significant differences in views by age and education. Voters ages 18 to 29 are the only age group in which more say they know little or nothing about the candidates running for Congress in their district (60%) than say they know at least a fair amount (39%). Awareness increases with age: Fully 76% of voters ages 65 and older say they know a great deal or fair amount about their district’s candidates. The level of candidate awareness is also greater among those with higher levels of education. Among those with no college experience, 54% say they know at least a fair amount about the candidates running for Congress in their district; this compares with 59% of those with some college experience, 62% of college graduates and 69% of postgraduates. There are no significant differences in candidate knowledge between Republican and Democratic voters. Two-thirds of registered voters say they are either somewhat (52%) or very (14%) satisfied with their choice of candidates for Congress in their district this November; 31% say they are not too (24%) or not at all (7%) satisfied with their choices. Younger voters – who express some of the lowest levels of candidate knowledge – also are among those least satisfied with their choices this fall. Overall, 54% of voters ages 18 to 29 say they are at least somewhat satisfied with their choices, compared with 42% who say they are not too or not at all satisfied. Among all older age groups, larger majorities express satisfaction with the candidates, including 74% of voters ages 65 and older. Those who have graduated from college are more satisfied with the candidate choices than those who have not. Still, majorities across educational groups say they are at least somewhat satisfied with their choices. There is no significant divide on this question between Republican and Democratic voters. When asked about their own expectations for 2018, registered voters are about evenly split in terms of who they think will win the majority in the House of Representatives. By comparison, more voters say the GOP will hold a majority in the Senate than expect the Democratic Party to take control of that chamber. Overall, 51% of registered voters say they think the Republican Party will hold a majority in the House, while slightly fewer (46%) say the Democratic Party will hold a majority in the 116th Congress. Partisans are about equally confident that their own party will have the majority: 82% of those supporting Republican candidates say they expect the GOP to hold the House majority; 77% of those supporting Democratic candidates say they expect their party to win the most seats. The balance of expectations about the future partisan control of the Senate tilts to the GOP: 57% of voters expect the GOP to hold a majority of seats in the Senate, while 40% expect Democrats to take the majority. Republicans overwhelmingly say that that their party will hold the Senate majority (87%), with just 11% saying they expect the Democratic Party will take control of the Senate. Among Democrats, 62% expect the Democratic Party to control the chamber in January, but 37% expect the GOP will maintain a majority in the Senate. 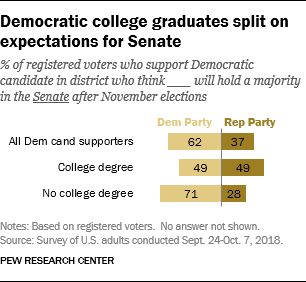 Among Democratic voters, those with a college degree are more skeptical about their party’s chances in the Senate than are those without a college degree. As many college graduate Democratic voters expect the GOP to win a majority in the Senate as say they expect the Democratic Party to win the most seats (both 49%). By contrast, a majority of Democratic voters without a college degree (71%) expect the party to win a majority in the Senate this fall. There are no educational differences among Democrats in expectations for the House and there no significant differences among Republican voters by education in expectations for the House or Senate. 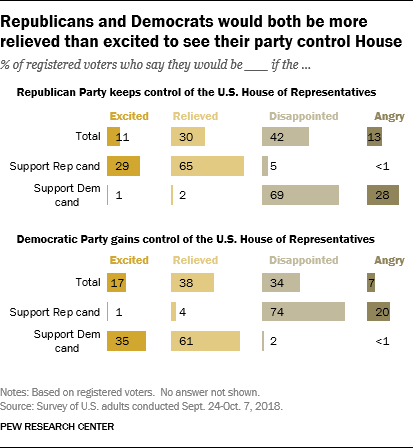 When voters are asked how they would react if the Republican Party keeps control – or if the Democratic Party gains control of the House – the most common sentiments overall are disappointment or relief, rather than excitement or anger. Among voters who support Republican candidates, about two-thirds (65%) say they would be relieved if the Republican Party maintains its majority in the House. Roughly three-in-ten (29%) say they would be excited. Few (5%) would have a negative reaction. Voters who support Democratic candidates are similarly more likely to say they would be relieved (61%) than excited (35%) if their party gained control of the House. Somewhat more Democratic than Republican voters express excitement at the prospect of their party holding the House majority (35% vs. 29%). Large shares of both parties’ supporters say they would be disappointed if the other party had control of the House after the election (69% of Democratic voters say this of a potential GOP win, 74% of Republican voters say it about the prospect of a Democratic win). Two-in-ten GOP voters say they would be angry if the Democrats regained control of the House, while a somewhat larger share of Democratic voters (28%) say the same about the Republican Party holding their majority in that chamber. Not only do Republican and Democratic voters differ in their views of national problems and their policy preferences and values, they also differ in their self-described characteristics and personal backgrounds. 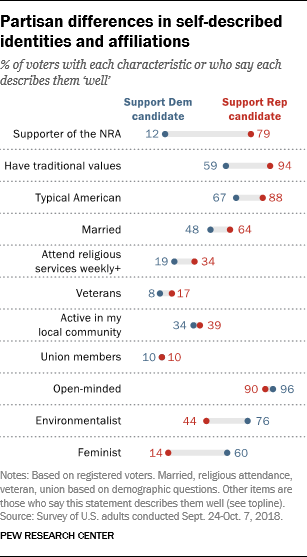 Nearly eight-in-ten voters who support Republican congressional candidates (79%) say that “supporter of the NRA” describes them well; just 12% of Democratic voters say this. Republican voters also are 35 percentage-points more likely than Democratic voters to say they “have traditional values” (94% vs. 59%) and are 21 points more likely to say “typical American” describes them well (88% vs. 67%). Republican voters also are also significantly more likely to be married than Democratic voters (64% vs. 48%) and about twice as likely to attend religious services weekly or more often (34% vs. 19%). And while military veterans are a relatively small share of voters overall, 17% of those who back GOP candidates say they are veterans, compared with 8% of Democratic voters. Democratic voters (60%) are much more likely than Republican voters (14%) to say “feminist” describes them well. And while about three-quarters of Democratic voters (76%) say “environmentalist” is a good description of themselves, less than half of Republican voters (44%) say the same. Similar shares of supporters of both Republican and Democratic candidates describe themselves as active in their local community. And nine-in-ten or more in both parties consider themselves to be open-minded.